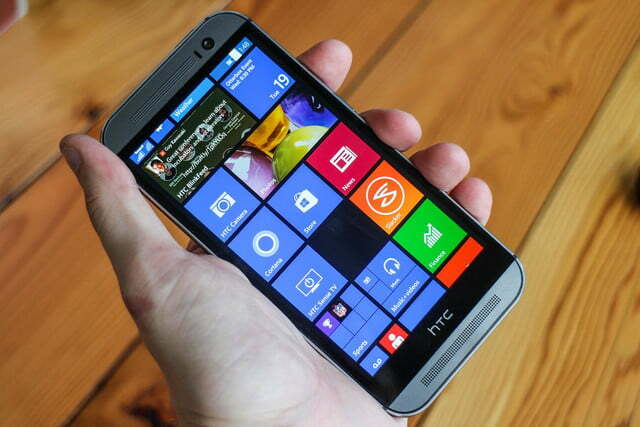 The Windows Phone version of the HTC One M8 has great battery life, a high-end design, and great specs. 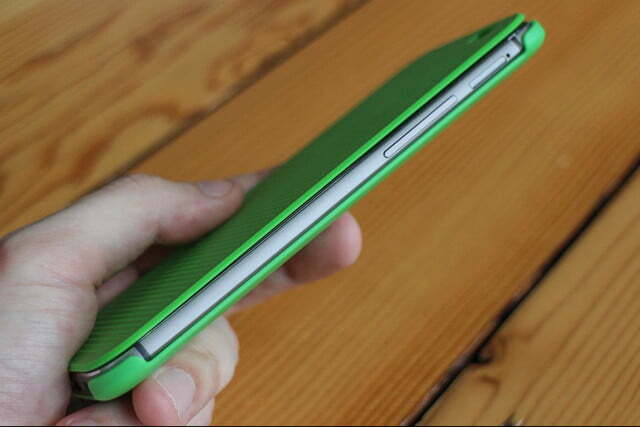 But it also comes with Windows Phone’s flaws. 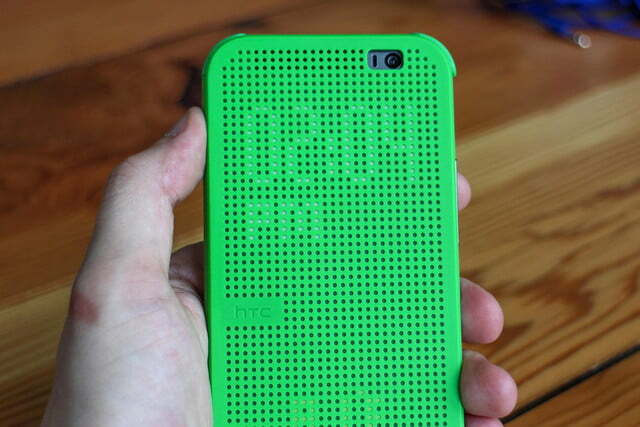 If you want a Windows Phone, this is the best. 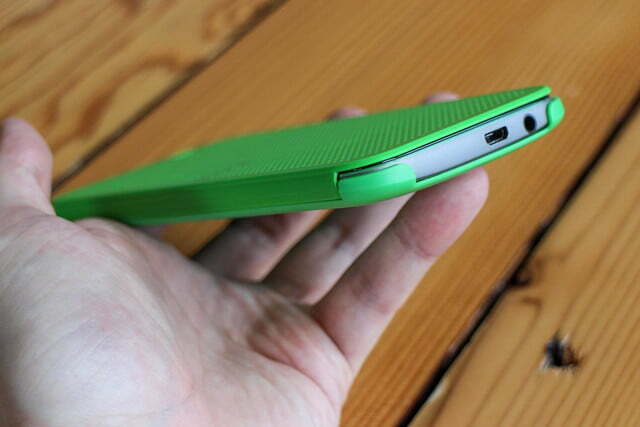 No manufacturer has ever made the exact same device with the exact same specs for Android and Windows Phone. 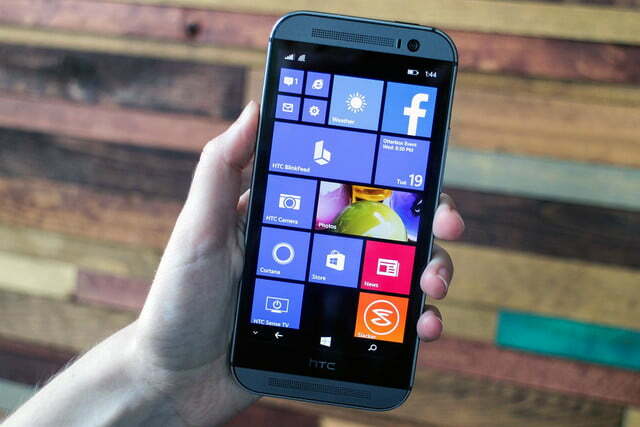 The HTC One M8 is now available for both Android and Windows Phone. Even though the two devices are identical, down to the very core, the two M8 models seem like completely different phones because of the huge difference between the Android and Windows Phone user experience. 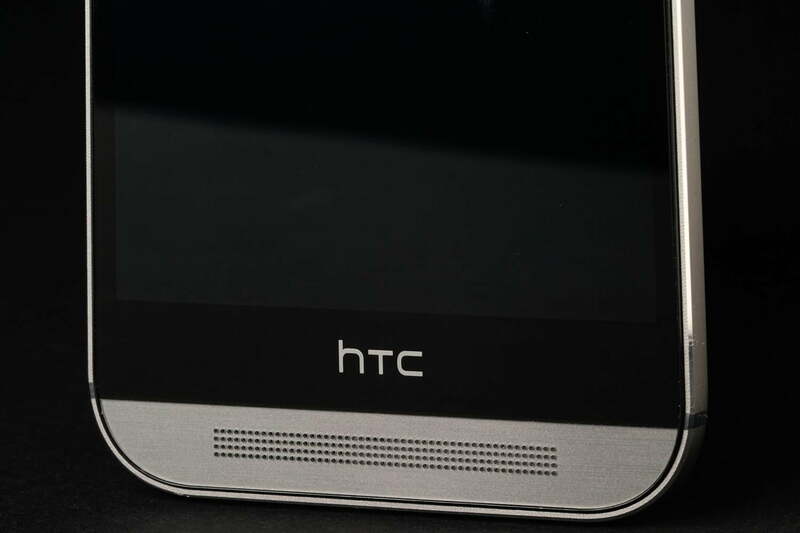 HTC’s One M8 with Windows Phone turns the company’s Android flagship into the third truly premium Windows Phone ever, on the heels of the Nokia Lumia Icon and Lumia 1520. If you like the look and feel of Microsoft’s mobile OS, but haven’t liked any of the phones running it, this version of the M8 might just fulfill your wildest dreams. 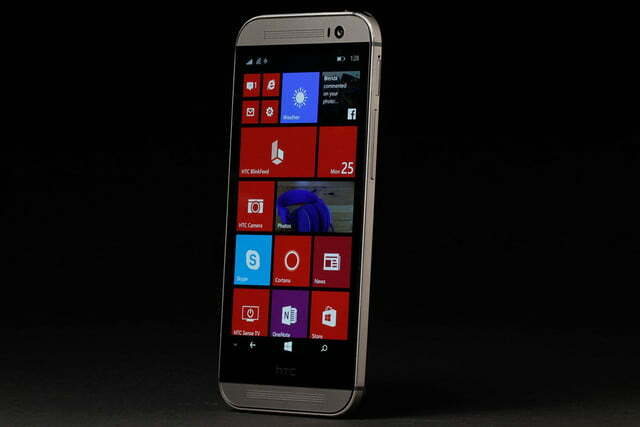 HTC made sure that the Windows Phone M8 matched the original’s sleek, high-end look and feel. 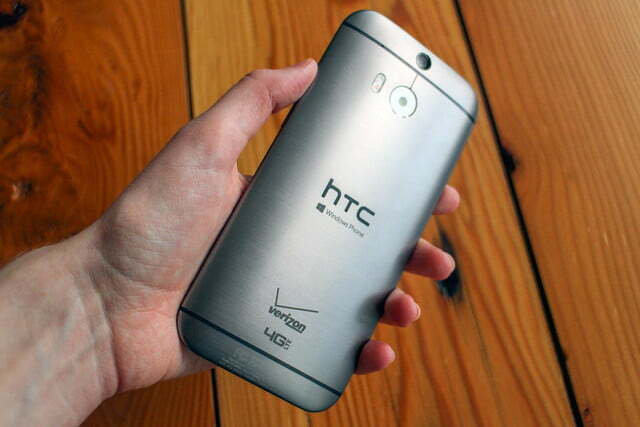 The device is encased in the same, brushed aluminum unibody as the Android version. 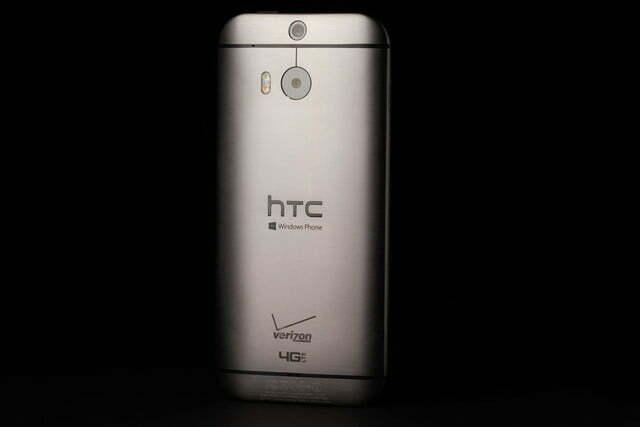 There’s no arguing that the HTC One M8 for Windows Phone is much better looking than its high-end Nokia Lumia counterparts. 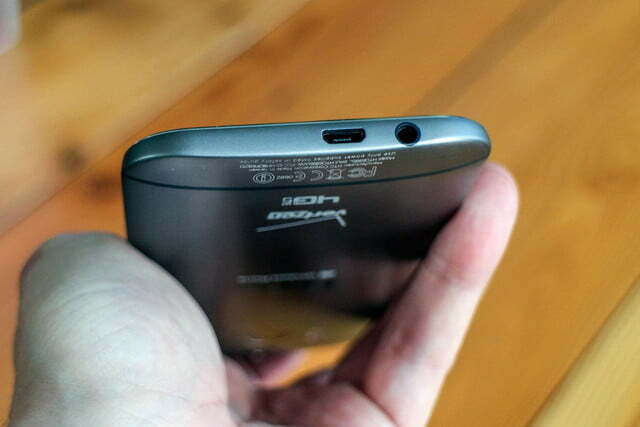 All the buttons are in the same familiar places and it features two BoomSound speakers on the front, for maximum sound while watching videos. 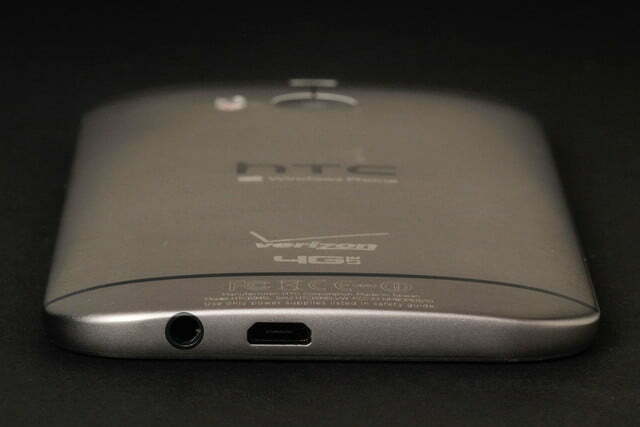 The only real difference is the small Windows Phone logo on the back, positioned right below HTC’s brand. In our review of the Android M8, we said it was the most premium and well-made smartphone on the market and that’s still true with the Windows Phone version. However, with that comes the same slippage problem, lack of waterproofing features, and the awkward power button placement. 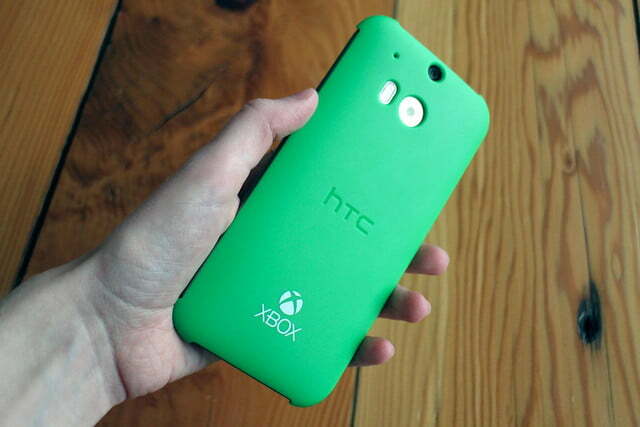 Still, there’s no arguing that the HTC One M8 for Windows Phone is much better looking than its high-end Nokia Lumia counterparts. 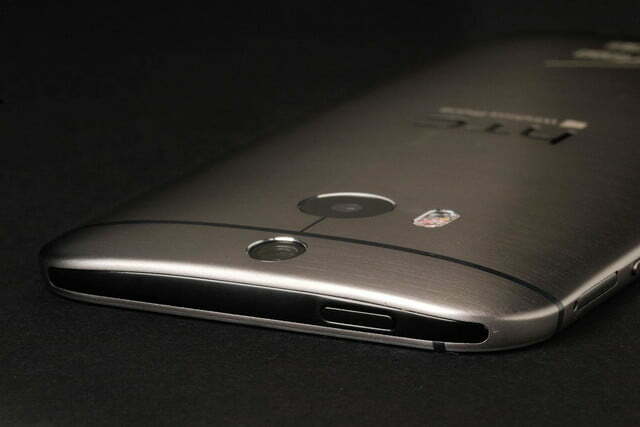 When it comes to operating systems, it’s hard to find two that are more different than Android and Windows Phone 8.1. 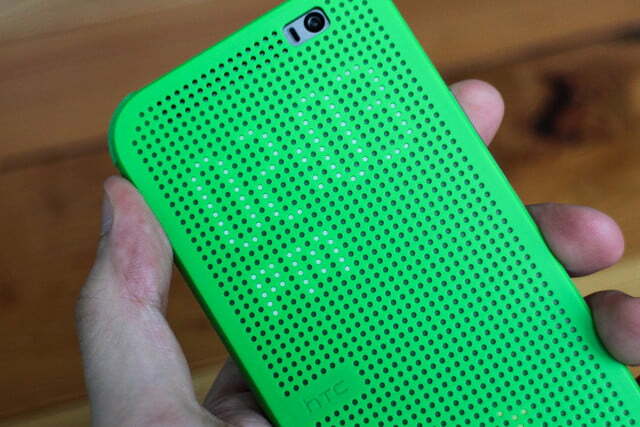 Android is by nature fully customizable. 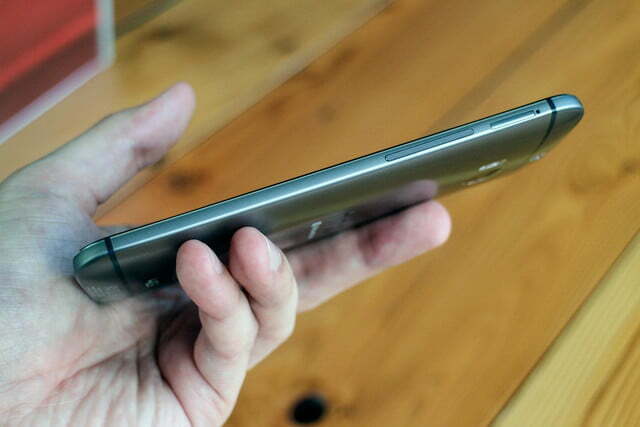 Windows Phone is neither customizable nor flexible. Sure, you can resize the tiles, move them around, and set pictures for added flair. But no matter how hard you try, you can’t escape the fact that everything is square or rectangular. 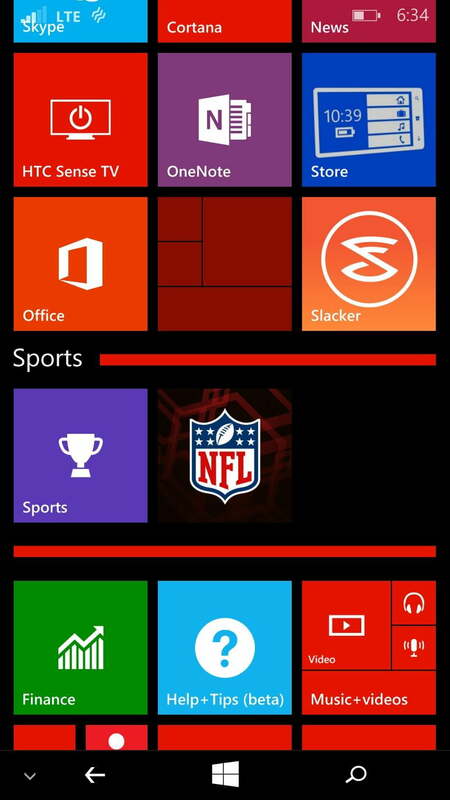 There aren’t multiple home screens, either – just an endless river of tiles. 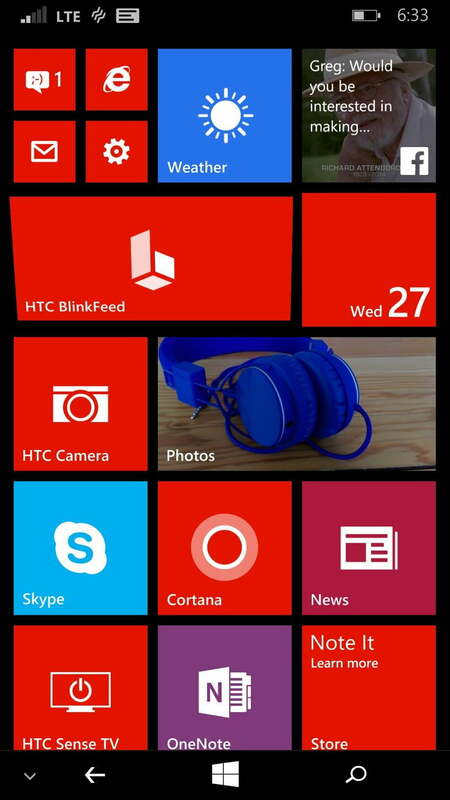 Depending on your point of view, Windows Phone is either an atrocity or the most beautiful, colorful, and innovative mobile operating systems around. When it comes to mobile OSs, it’s usually personal, so if you love Windows Phone, you’re sure to enjoy how it looks on the M8. Microsoft’s OS looks particularly nice on larger screens like this one and the new folder option makes app placement more customizable. 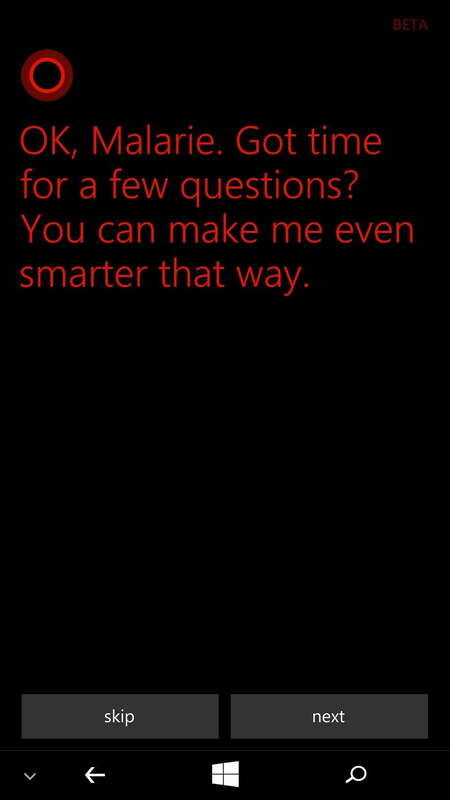 Cortana works well and the updated OS runs smoothly. 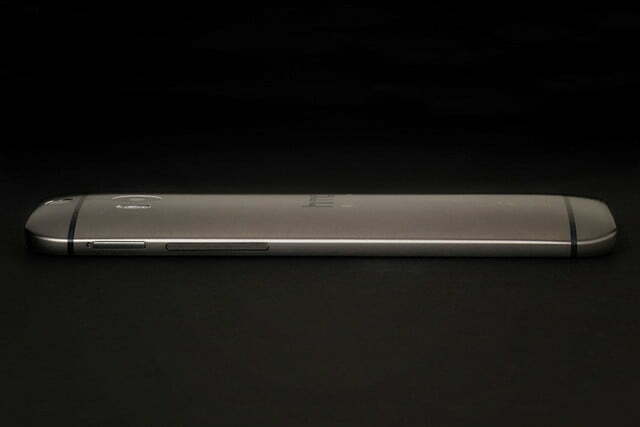 All in all, Windows Phone 8.1 works like a charm on the M8. 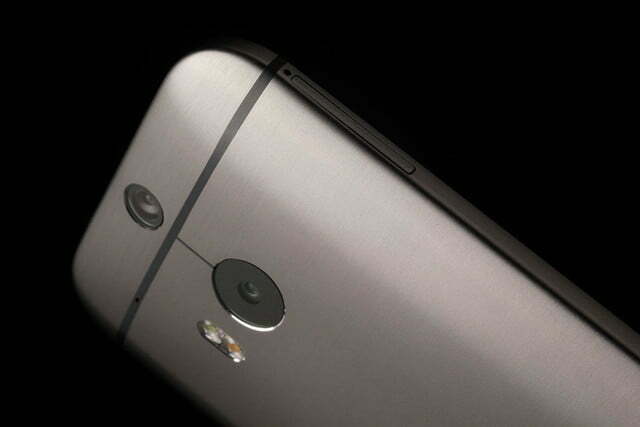 The main downside of having Windows Phone on the One M8, is that you miss out on many of HTC’s special features, including the Sense interface. 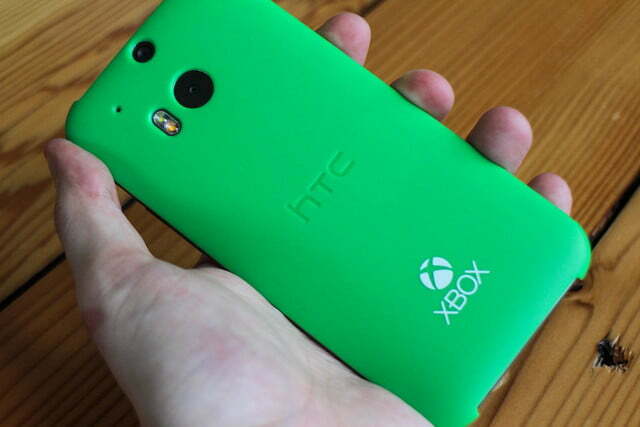 However, HTC made a serious effort to bring all of its favorite Android M8 features over onto Windows Phone. 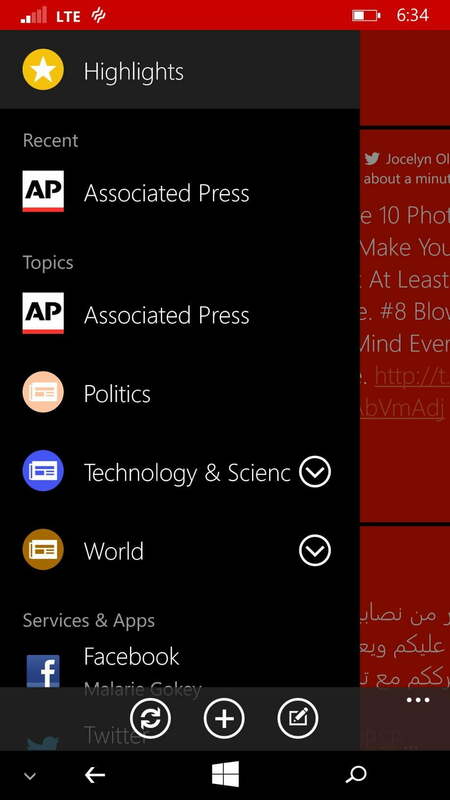 News aggregator BlinkFeed is installed on the Windows version, but it’s missing support for most social media apps. 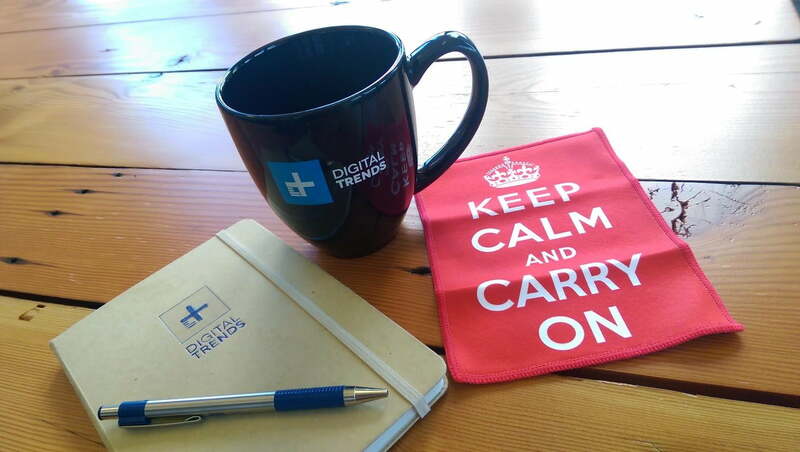 You can only choose Facebook, Google+, and Twitter. The Android M8 offers many more options. 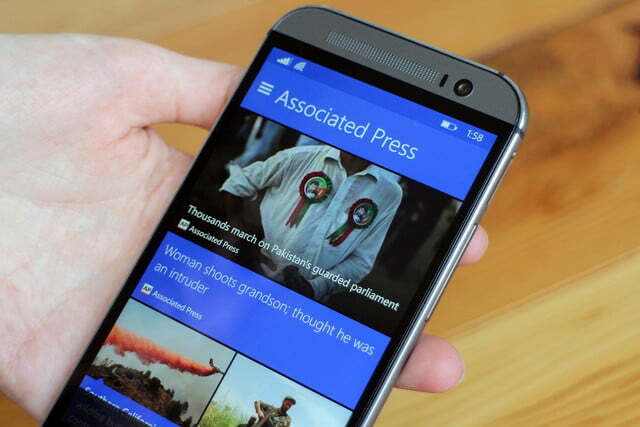 Otherwise, BlinkFeed looks and works the same as it does on Android. 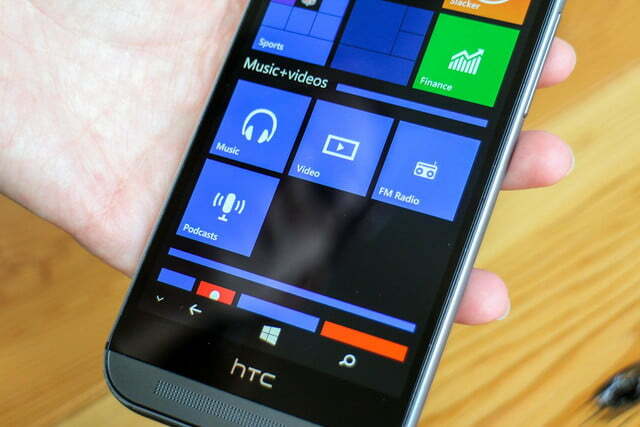 Finally, app support for Windows Phone remains behind Android and iPhone. The apps in the Windows Phone Store are not as plentiful, and many of them are not as well-built, as Android counterparts. 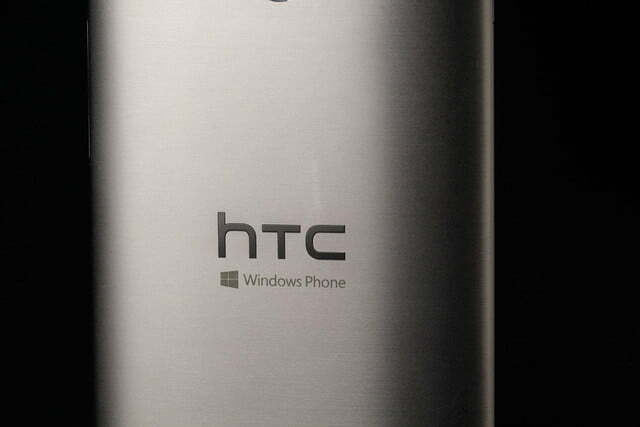 HTC kept all the same specs of the original on the Windows Phone M8. 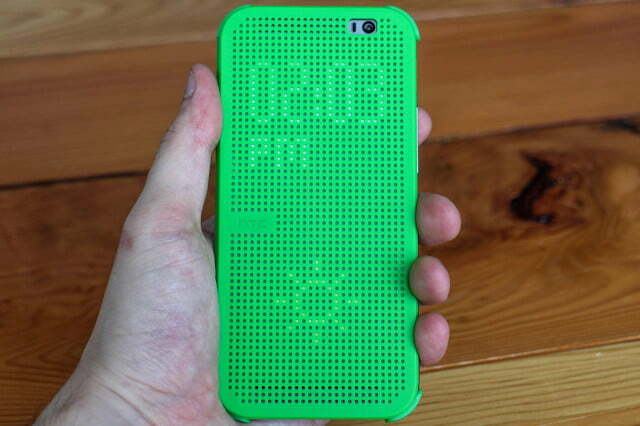 The device features the same 5-inch 1080p screen, with crisp colors and sharp detail. 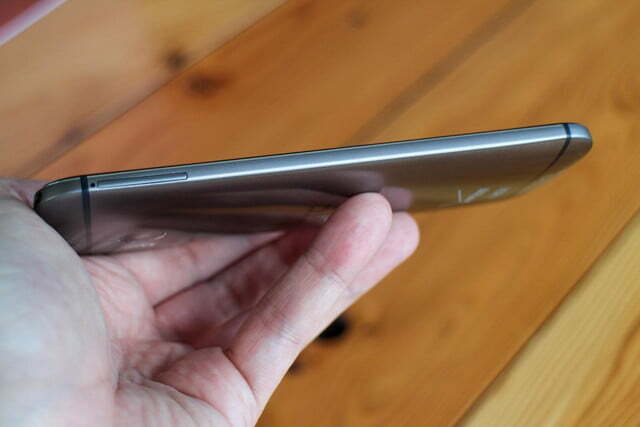 It’s a good size for watching YouTube videos, reading ebooks, and checking email. 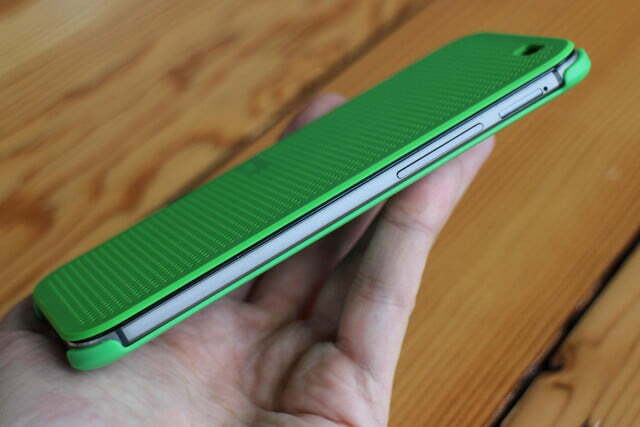 If you love Windows Phone, you’re sure to enjoy how it looks on the M8. 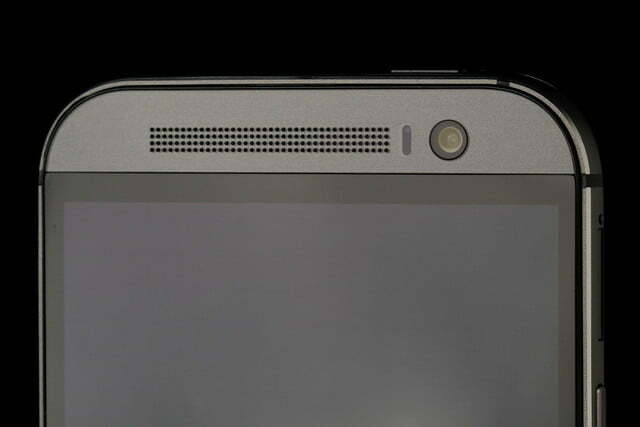 However, the thick bezels seem like a waste of space that could have been better put to use as part of the screen. Luckily, the Windows, back, and menu button panel pops up and down on command, so it doesn’t take up as much space as the Android navigation buttons do. 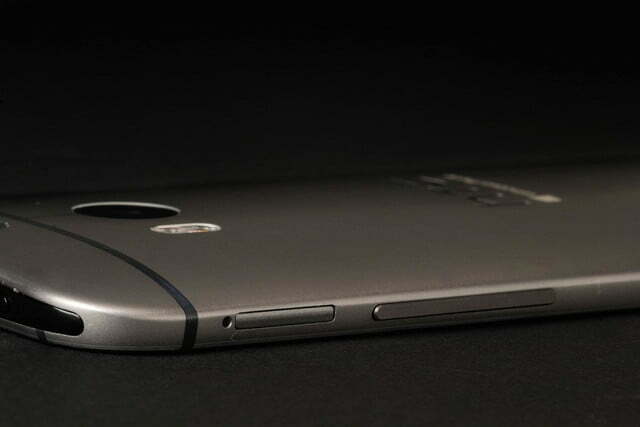 The phone is powered by the swift 2.3GHz Qualcomm Snapdragon 801 processor, which in addition to processing requests at fast speeds, also manages save a lot of battery life. 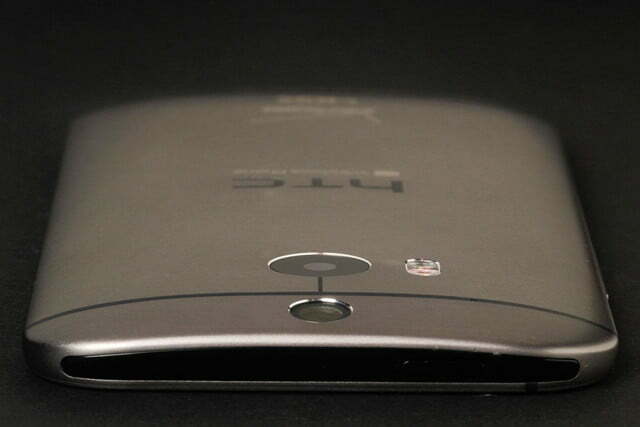 The Qualcomm chip is backed by 2GB RAM. 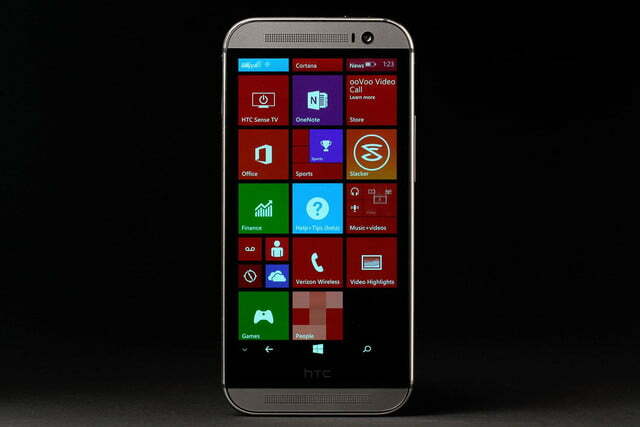 In benchmark tests, the Windows Phone HTC One M8 scored lower than its Android counterpart. 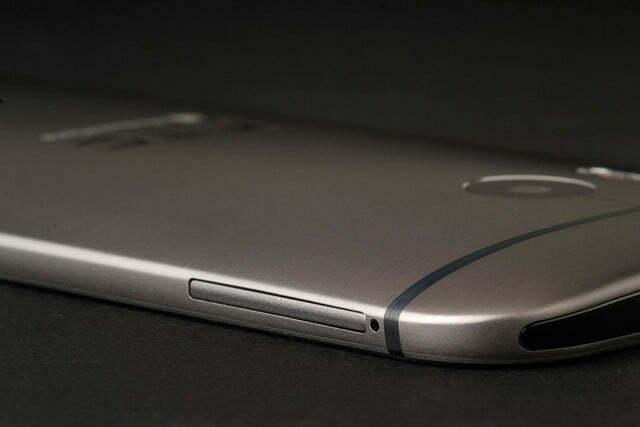 On the Antutu benckmark, it scored 26,208, which is much lower than the Android M8’s score of 31,075. The Android version also outperformed the Windows Phone M8 in the GFX Bench 2.7 T-Rex HD benchmark test, coming in at 1,052 offscreen, as opposed to the 1,574 scored by the Android M8 in the same test. 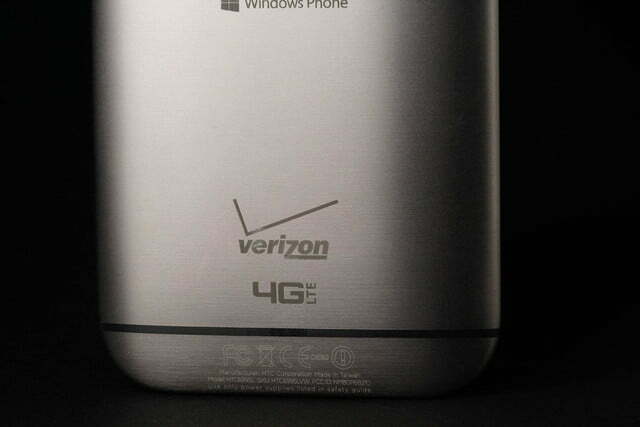 When used side by side, the Windows Phone M8 did seem slightly slower and less zippy than the Android original. 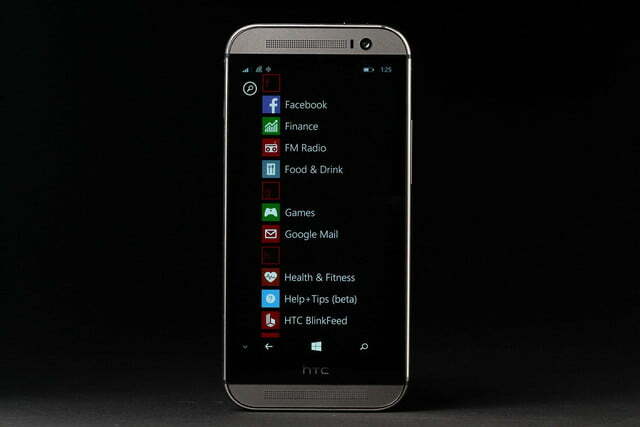 The Windows Phone version didn’t open apps as quickly as the Android model, but that said, it was still fast. The Windows Phone M8 comes with 32GB of storage built in, but you can always add more with a MicroSD card up 128GB in capacity. 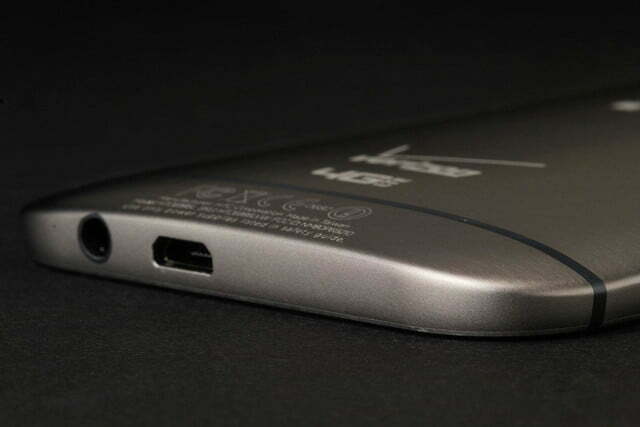 In terms of connectivity, it has NFC, Bluetooth 4.0, and Wi-Fi 802.11 b/g/n/ac. 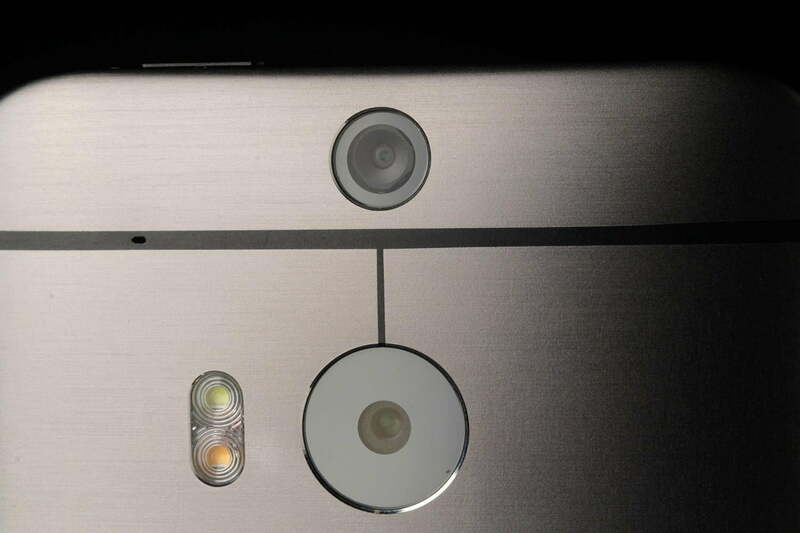 HTC kept the same UltraPixel camera on the back of the One M8 Windows Phone. It takes good close ups, but can over or under expose shots, depending on the lighting conditions. 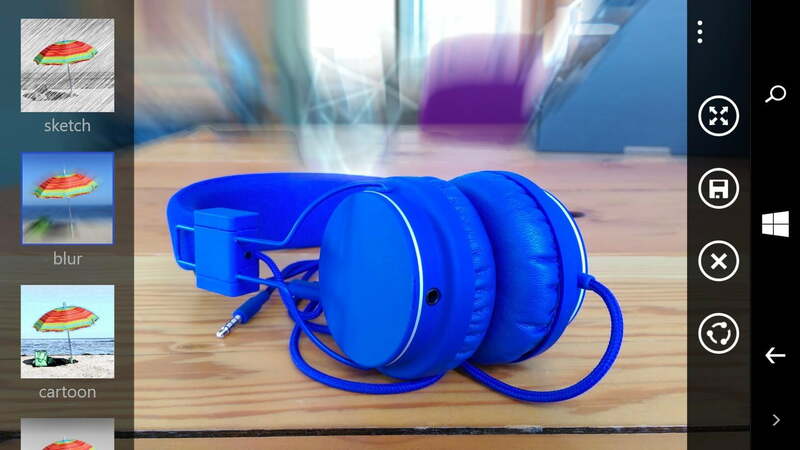 Shots of scenery and objects looked crisp and clear with strong colors. 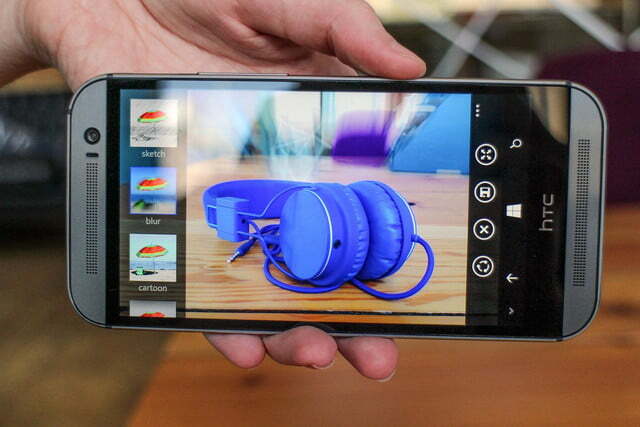 The camera app is slightly different on Windows Phone, but you can still access all the special editing options offered on the original M8, by clicking on the HTC Photo Edit option. Once you’ve opened the app, you can use the UFocus, Foregrounder, and Dimension Plus 3D effect to alter the photo’s depth of field, focus, and alter the background. 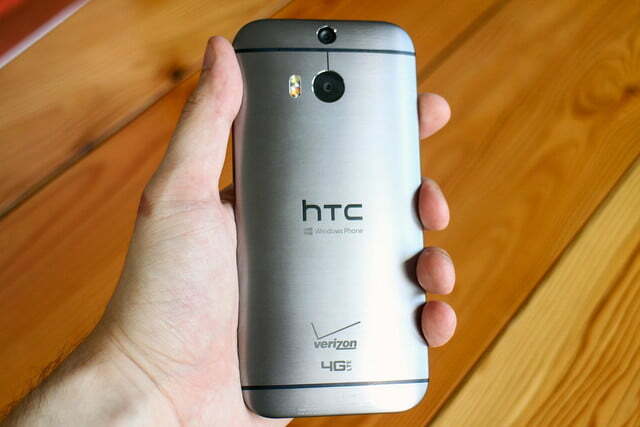 The 5-megapixel front-facing camera works great for selfies and offers one of the highest resolutions around. 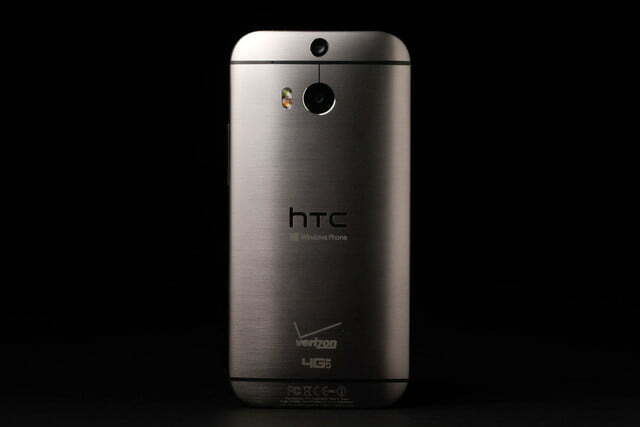 Call quality was clear and data speeds were swift. 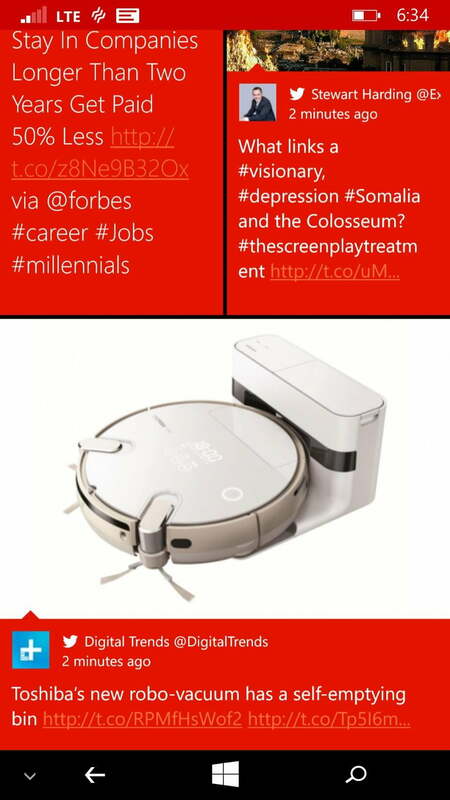 The Windows Phone One M8 handled these essential tasks well. One of the biggest advantages of having Windows Phone 8.1 installed on the M8 is that it significantly increases the battery life. 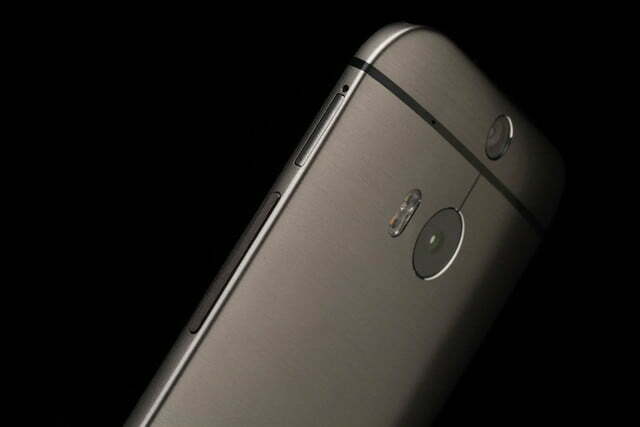 The Android M8 consumed energy much faster than the Windows Phone version. 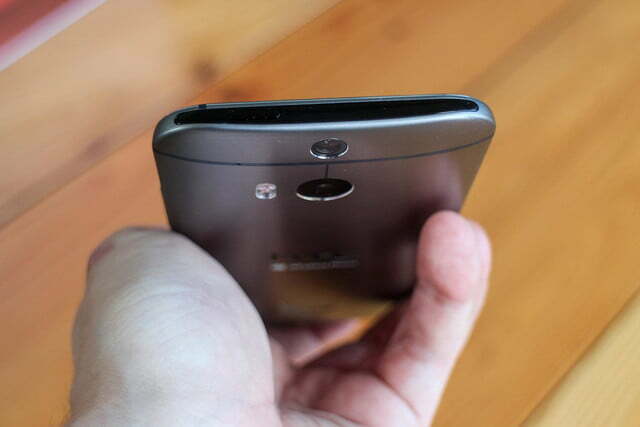 The Android M8 consumed energy much faster than the Windows Phone version, especially when it came to streaming video. In our tests, the 2600mAh battery lasted more than a full day on one charge and hung in there longer than its Android counterpart. Now that Windows Phone and Android have been put to the test on the exact same device, which has all the same hardware onboard, it’s clear that Windows Phone is the more efficient OS. 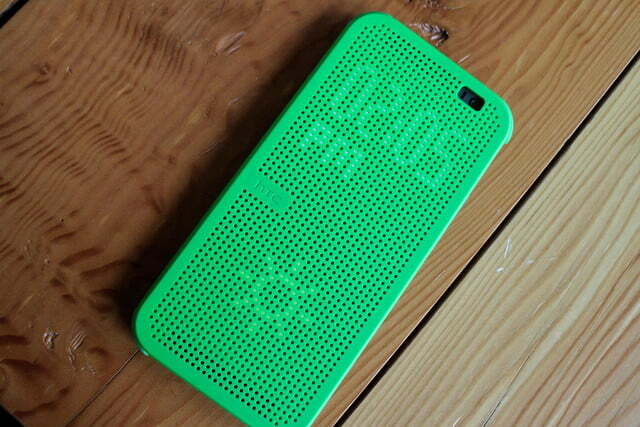 The One M8 Windows Phone has a lot going for it: great battery life, a high-end design, and great specs. However, it also faces an extremely tough battle. 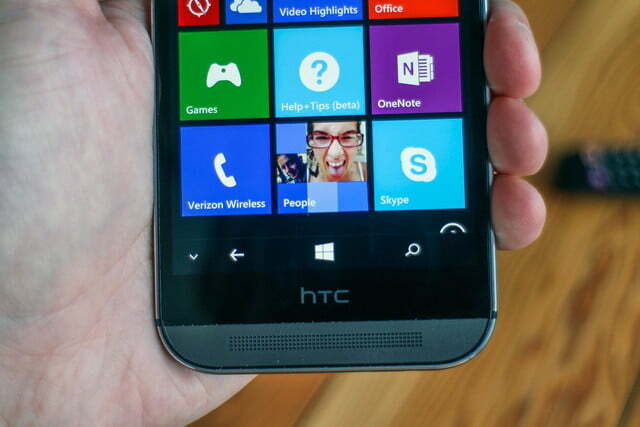 Windows Phone is not yet popular among customers and it doesn’t seem to be gaining much momentum. Given the limited amount of apps, the delayed release of new apps, and the very distinctive look of Windows Phone 8.1, it’s highly unlikely that a new smartphone buyer will look at the two phones side by side and choose the Windows Phone version. 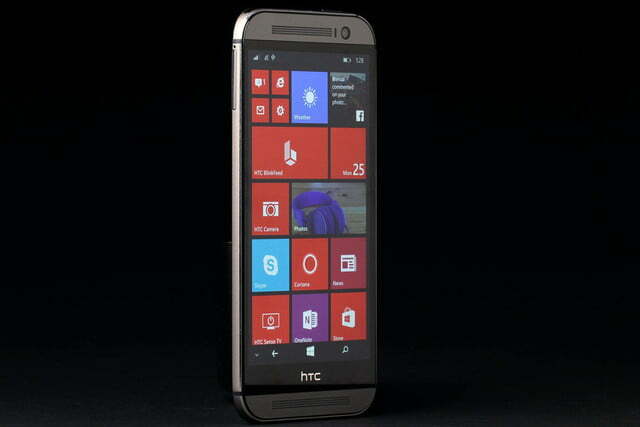 That said, if you’re already a fan of Windows Phone, you can’t do better than to get the HTC One M8 for Windows Phone.